For our final (!) meal in Philly, we went all out. 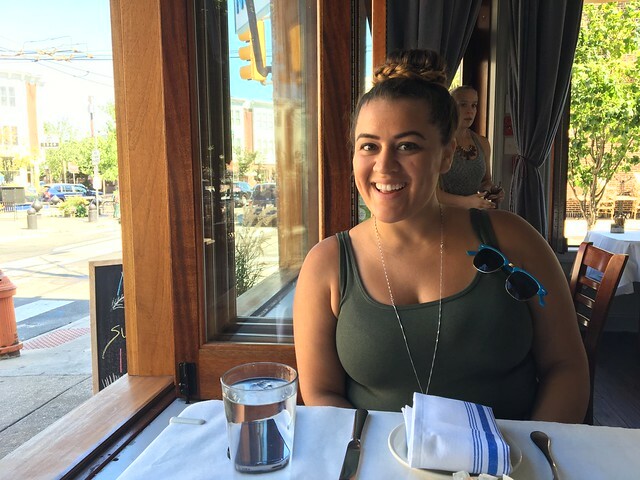 We had reservations at Fork, a contemporary American restaurant that specializes in small plates. We had reservations, but couldn't be seated until exactly that time. So, we waited for a bit and then returned inside. This is when we decided, well hell, let's go all out and do the house tasting menu while we are here. That gave me a choice of starter, pasta, main course and dessert. Plus, it includes all the little surprise gifts from the chef between courses. 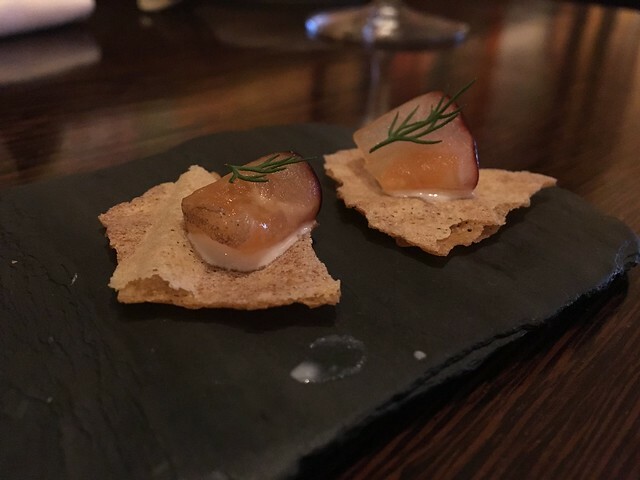 Nothing I love more than an amuse-bouche. 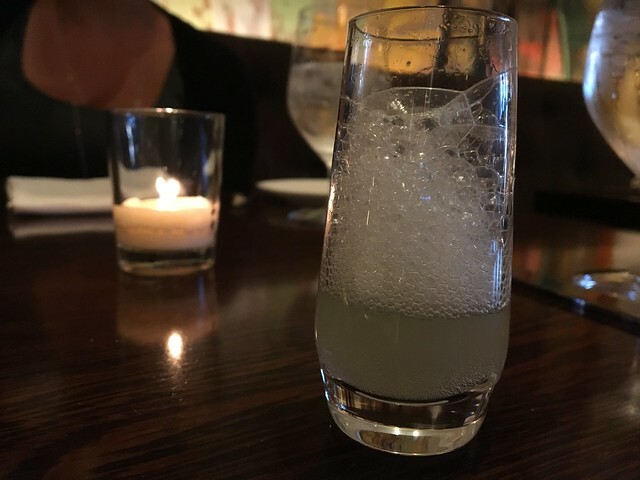 Well, we started with a celery soda palate cleanser. It's exactly what you would think - liquid celery. It certain woke up my tastebuds. Next was this tasty little crisp cracker bite. Then, a bialy with real, housemade Philadelphia cream cheese. Tasty, roasty flavors. Finally, our first course. I ordered the chilled melon soup with yogurt, basil and tamarind. 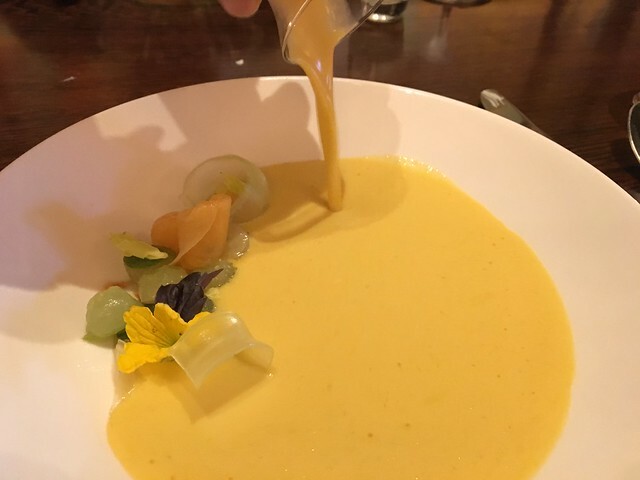 It was a beautiful dish presented as just the bits of melon and veggies before the soup was poured into the bowl. Lovely presentation. 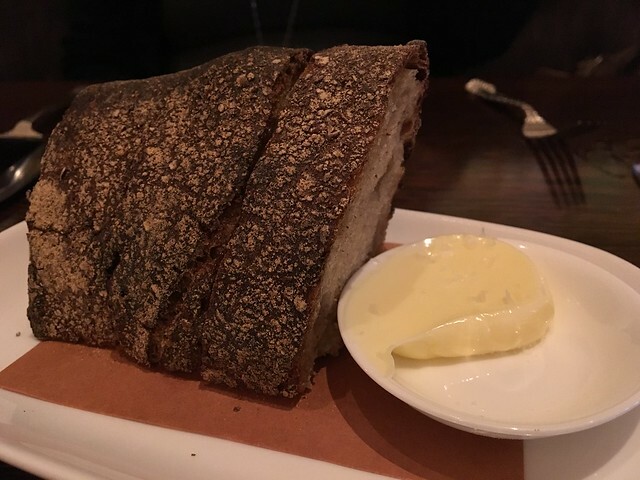 Next was a bread course with butter; hearty and rustic. Then, the pasta dish, which I think was my ultimate favorite. 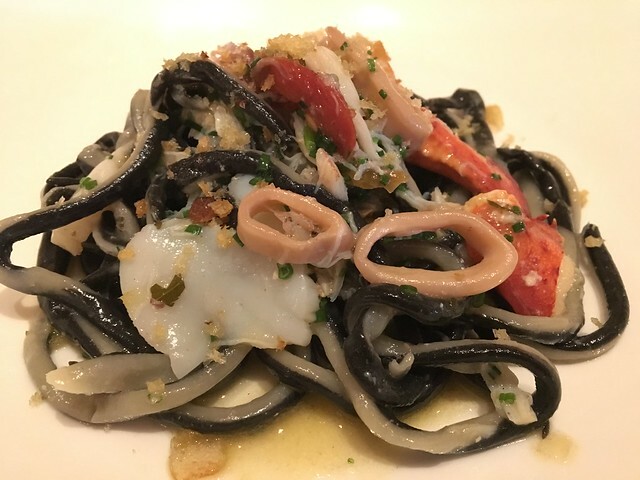 The black and white pici is served with fruits of the sea and pickled chili. The noodles had the perfect amount of chew and large chunks of buttery crab, lobster, calamari and more. Then, another fresh bread gift. 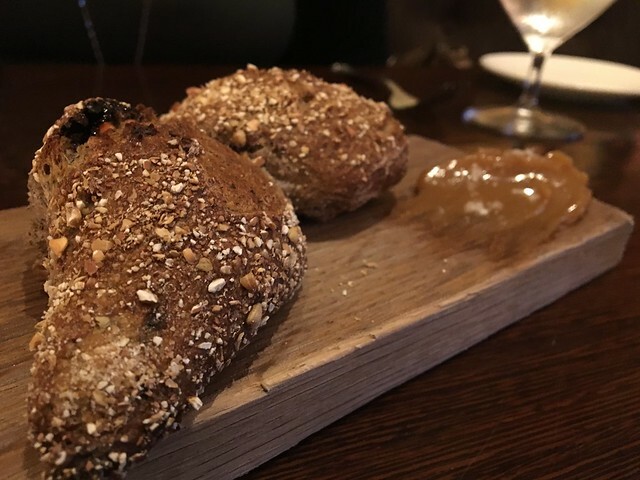 This one was a buckwheat roll with a seasonal jam. Very tasty. 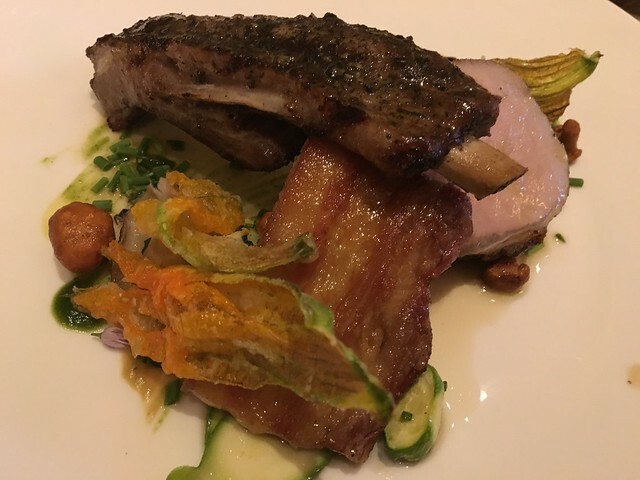 For an entree, I ordered the duroc pork, which came with loin, rib and belly, summer squash and chanterelles. 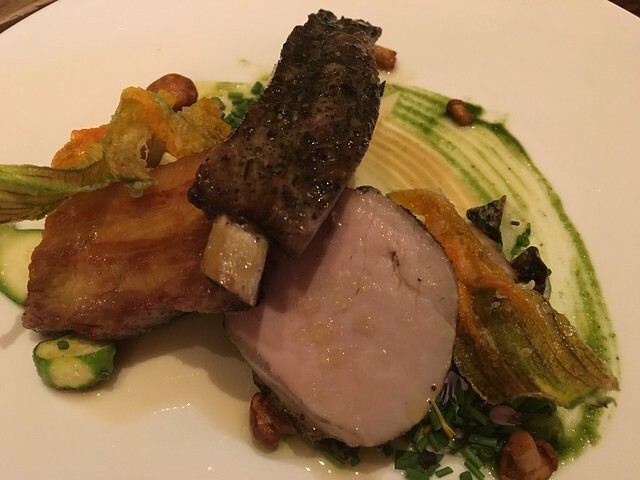 This dish was a nice summery take on the pork. Green, fresh flavors to go with the pork. The pork was tender, moist and quite good. 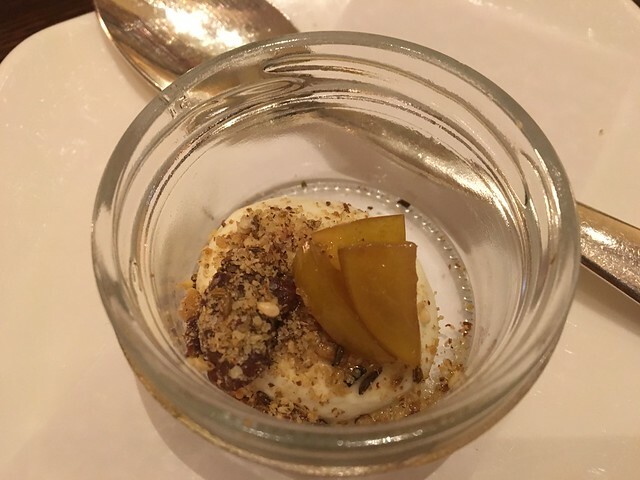 Afterward, another small, sweet bite from the chef. Light, but creamy. 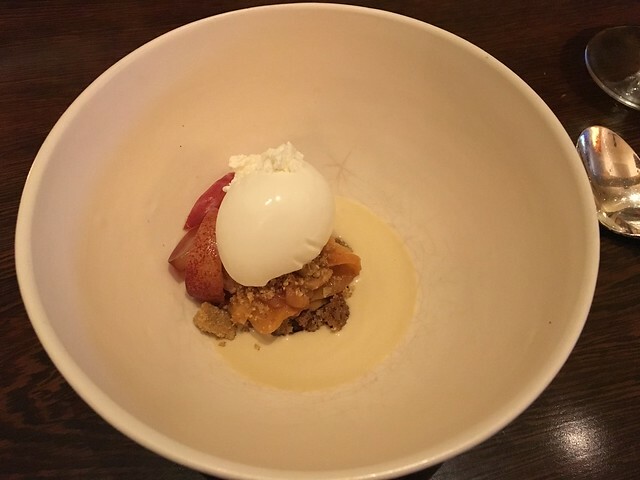 And, my dessert was peach crisp with sweet corn, sour cream and chamomile. Not overly sweet, but comforting and quite lovely. 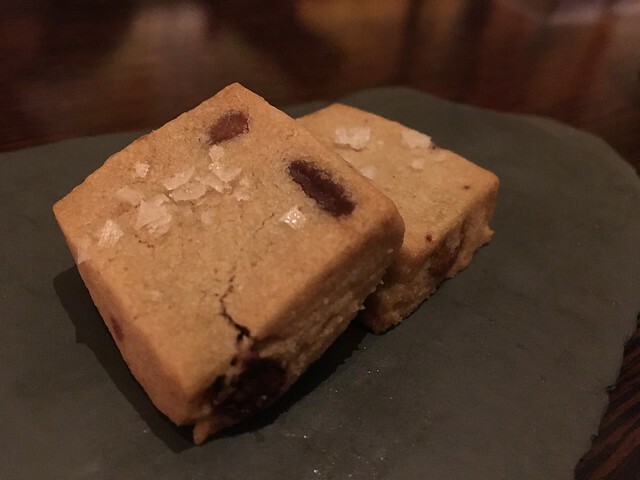 The final gift from the chef came in the form of these chocolate chip cookies. I think we're all aware on my feelings about chocolate chip cookies, but I imagine this hits a certain level of comfort food for many people. So, it makes sense to end on something like this. Overall, this was a lovely experience. It's more than a meal. 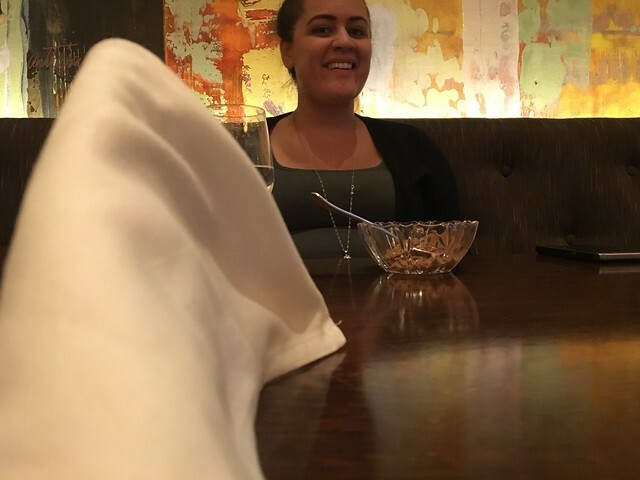 We laughed as we stumbled through a fancy meal together and got excited with each new surprise from the chef. It was a great way to end our time together in Philadelphia. Until next time. Does the name Morimoto sound familiar? As in, Masaharu Morimoto? The Japanese chef is best known as the original Iron Chef. After training in Hiroshima, he traveled to New York City, where he worked at incredible restaurants, like Nobu. He then got his start on Iron Chef and then eventually opened a restaurant in his namesake, Morimoto, in Philadelphia. 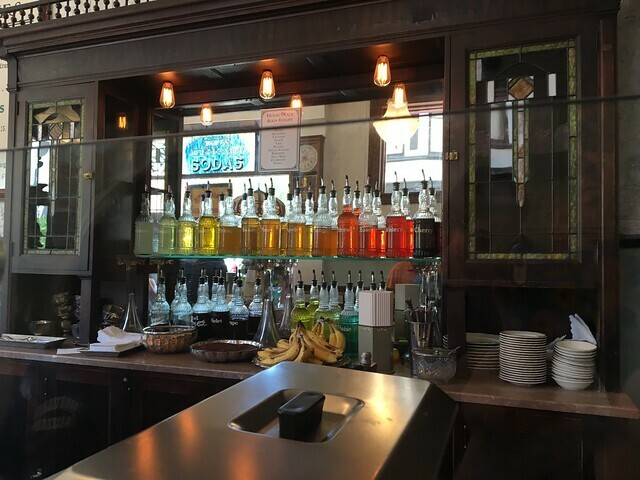 The restaurant is pretty cool. 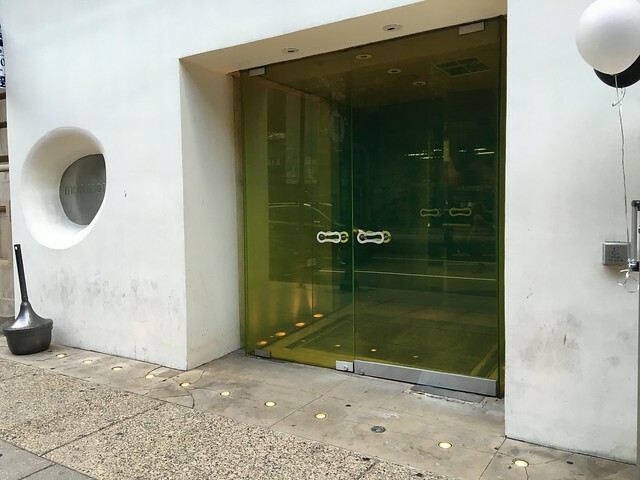 It stands out on the block because of the white exterior, yellowish green see-through doors and just a small window that notes "Morimoto." The interior has these sort of wavy light features and seats that alternate colors. Interesting. 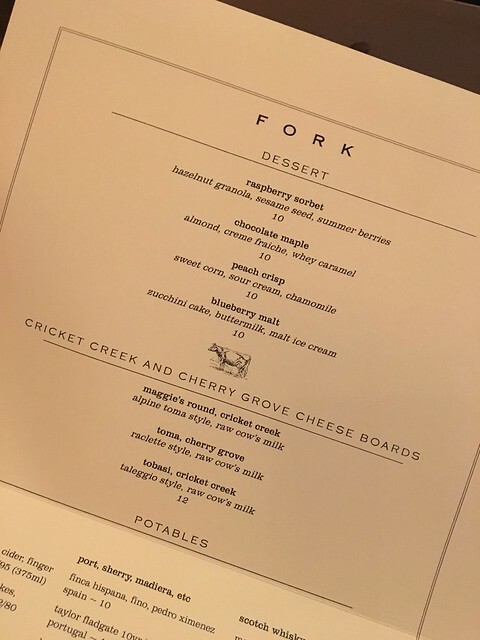 The menu has lots of tempting options. 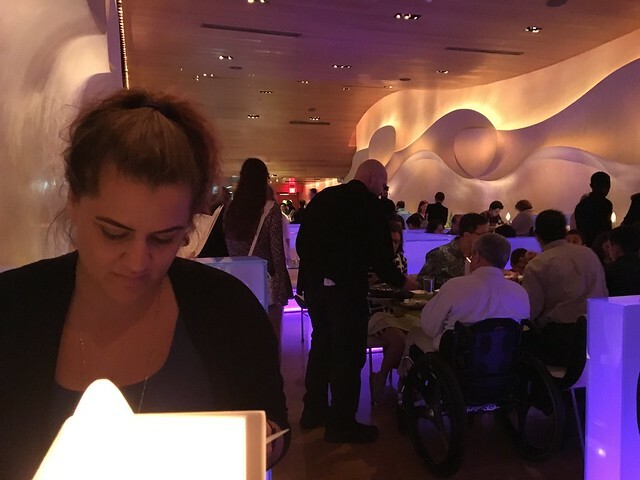 One day I'll be able to afford the Omakase - “chef’s choice” a multi-course tasting menu designed to allow you to experience the essence of Morimoto’s cuisine. 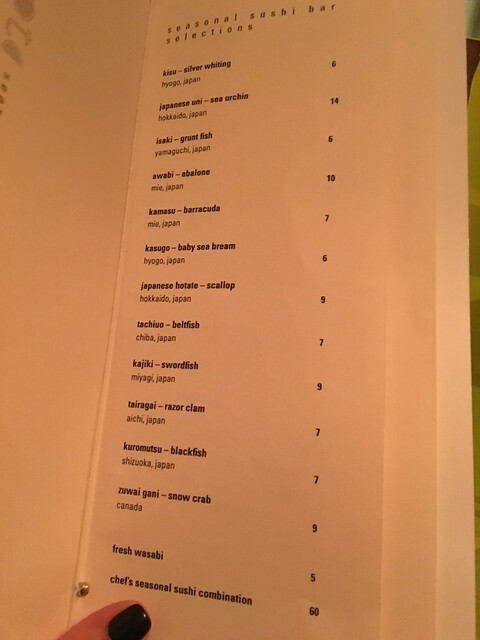 But, for now, we ordered the "chef's combination - sushi, sushi rolls and sashimi" (the $90 option) and split it. 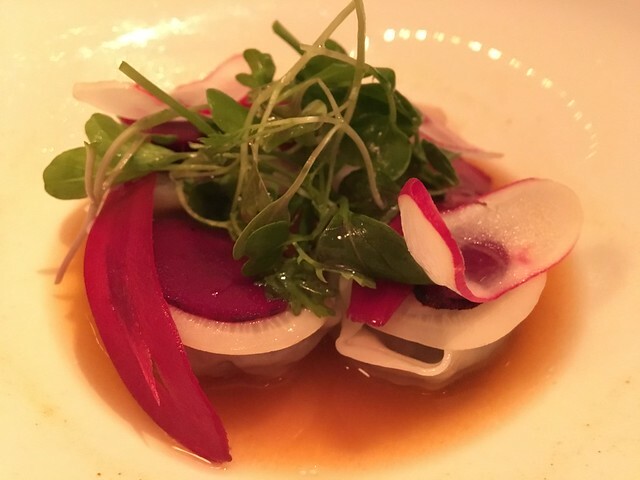 But, first, something hot: wagyu dumplings with a kanzuri-miso broth. So tasty. Tender, flavorful with a crisp fresh topping. Quite good. The sampling of sushi was very good. 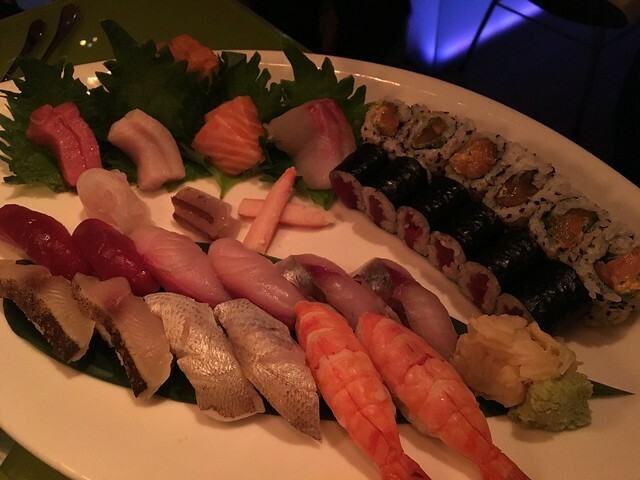 We had two rolls, some nigiri and some sashimi - including hamachi yellowtail, tuna, mackerel, and ebi. The server rattled off the different kinds so quickly, I lost most of them. But, I'll say this: I loved almost all of them. 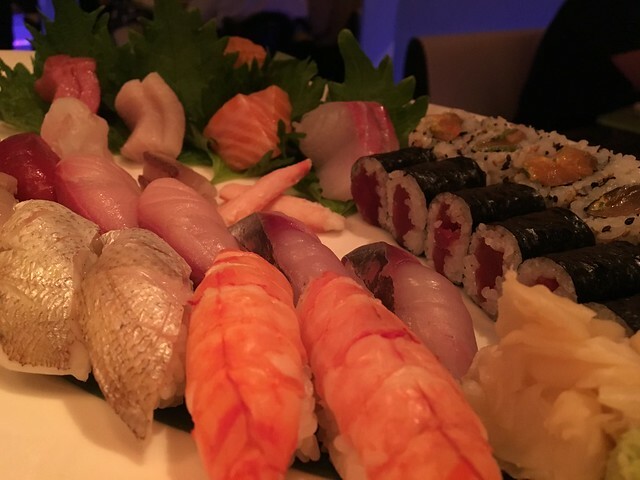 The rolls were delicious, and I even liked all of the sashimi. The skin-on nigiri was new for me and the mushier pieces took an extra bite. But the thing is that it's all so fresh. It doesn't taste fishy or off. It is actually a very light, fresh flavor. There's nothing especially remarkable since it's not a new take on it; it's classic but a very quality piece. And, very tasty. 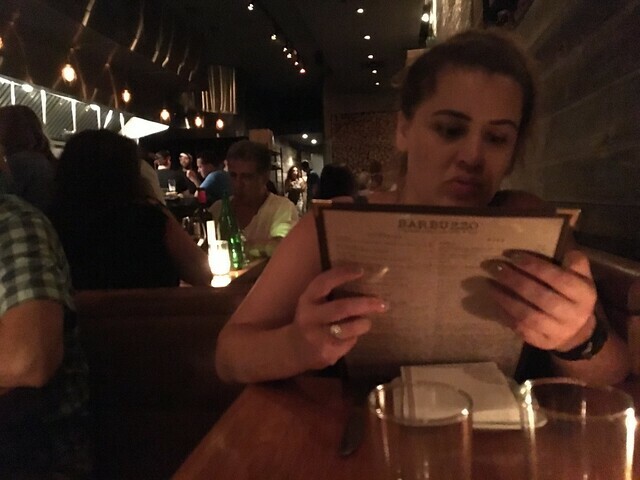 It's a very typical Candace move to have dinner at one place and dinner at another. Why? Well, I get to try TWO restaurants, instead of just one. So, I plan my meals very, very carefully. 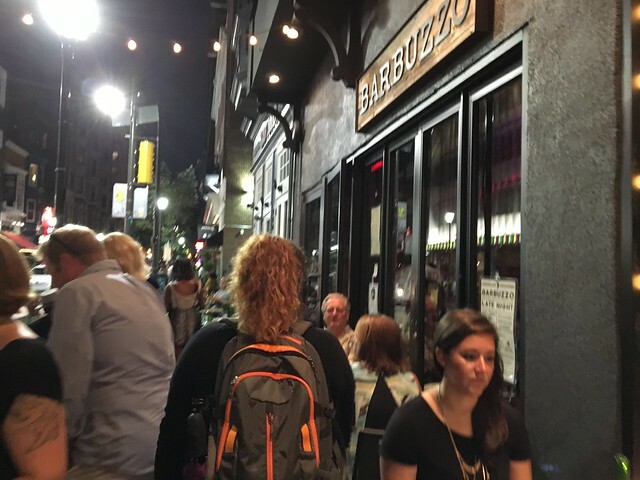 Barbuzzo is known for their "salted caramel budino," so I strategically made sure we would be able to hit up this restaurant for dessert. We had reservations, so we were able to get in pretty easily. But, make no mistake, this place gets tightly packed. We were tucked away in a two-seater that left virtually no room for wiggling. The inside, while dark, was cool. Very modern. Very hip. 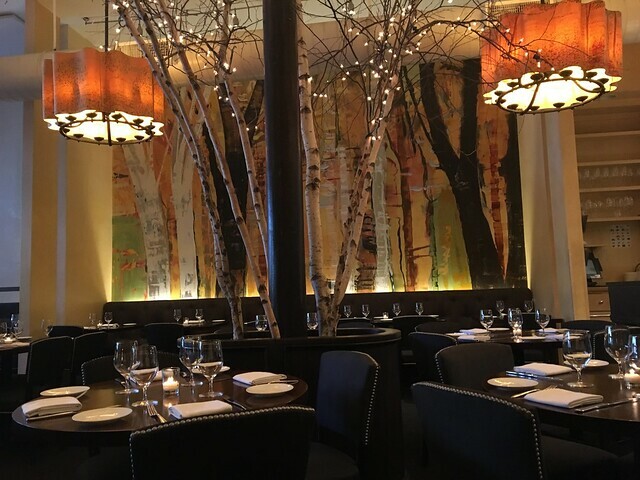 Wood, metal, marble all intermingle to create a beautiful, lively atmosphere. 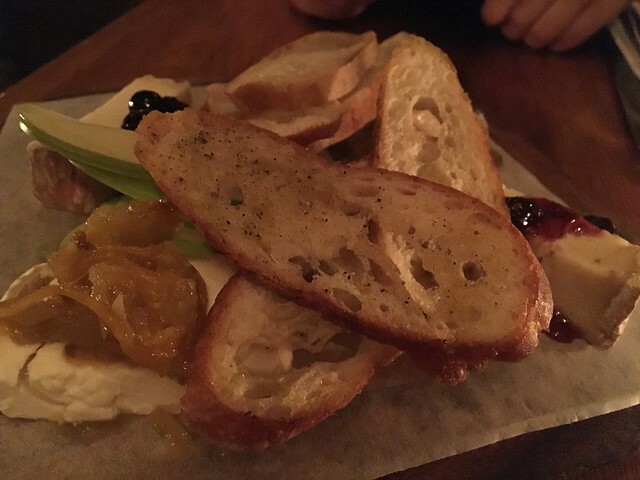 Kaitlynn and I looked over the menu briefly and decided to snack on a cheese board (this was more my persistence. Because mmm cheese). This is what we ordered: Artisan Cheese Board with baguette, crostini and marcona almonds: cana de cabra, goat, Spain, with fennel mostarda; tomme de crayeuse, cow, France, with seasonal jam; quadrello di bufala, buffalo, Italy, with roasted grapes; and gorgonzola piccante, cow, Italy, with rosemary truffle honey. My. God. This was the best cheese I've ever had. 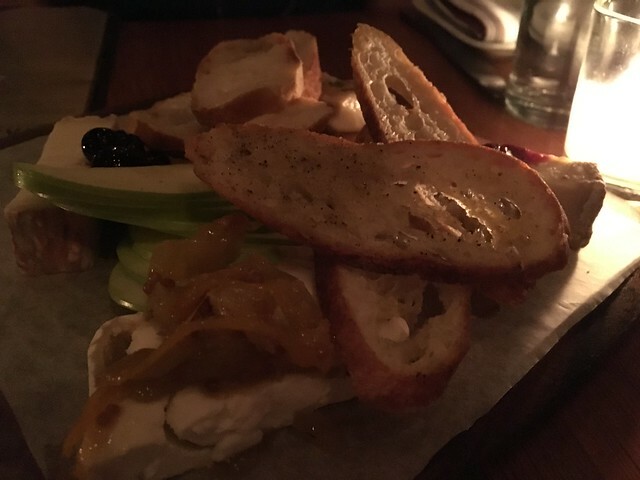 Each cheese had some delicious sweet or savory accoutrement, and the perfectly toasted crostini, sour apple and sweet grapes just rounded it out. 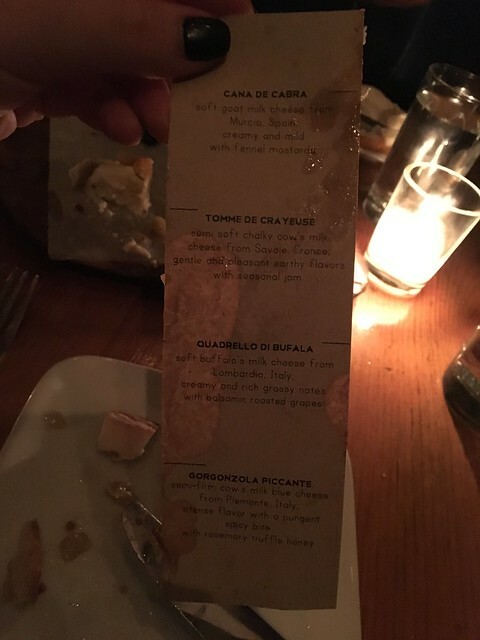 I've had my share of cheese, but this cheese board was on. point. The nutty, the savory, the creamy. Just delicious. 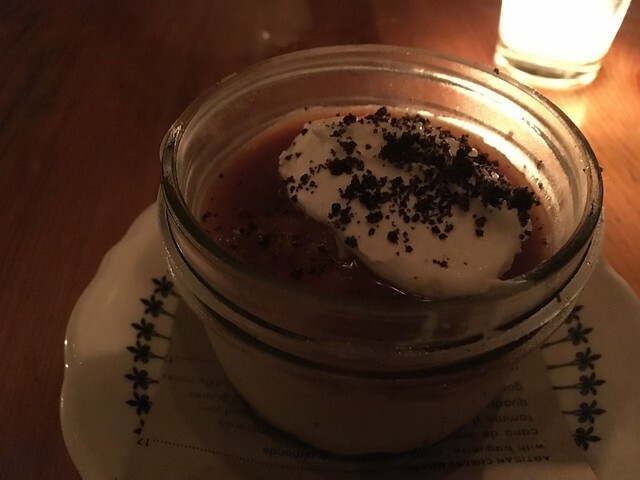 And straight from appetizers to dessert; the salted caramel budino came with a dark chocolate crust, vanilla bean caramel and sea salt. It was so rich and indulgent and literally everything I'd want from a dessert. The crust was a perfect base for the creamy, silky caramel. I think I set this restaurant up for a win: cheese appetizer and caramel dessert. But, I wouldn't have it any other way. 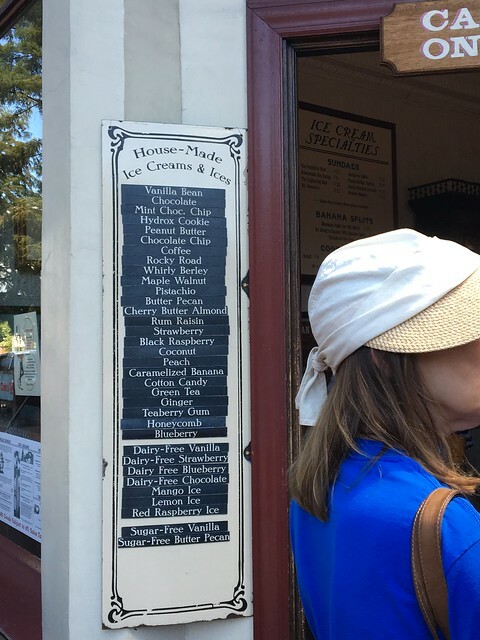 I don't think any trip to a new city is complete without seeking out its best ice cream. 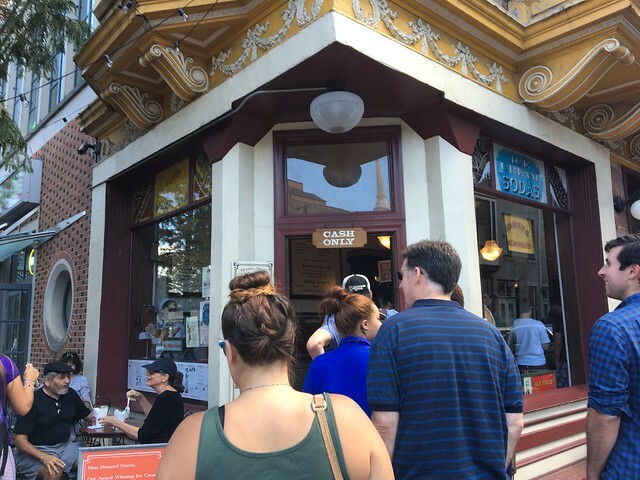 And, in Philadelphia, all signs pointed to The Franklin Fountain as being the ~iconic~ ice cream shop. So, off we went! convention was filled with industry wisdom, inspiration and a whole lot of incredibly rich ice cream! 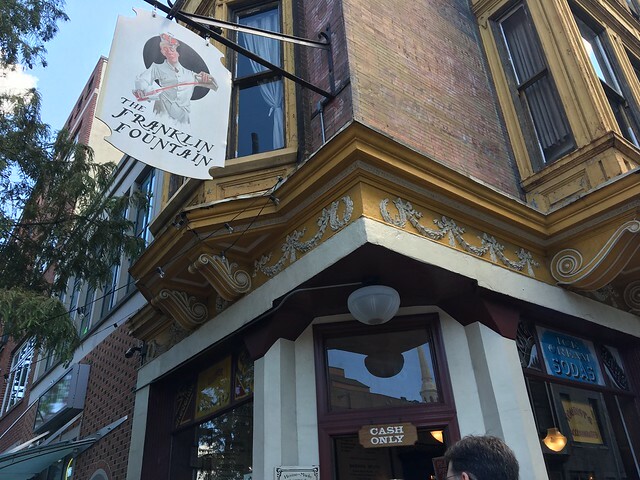 The Franklin Fountain aims to serve an experience steeped in ideals, drizzled with drollery, and sprinkled with the forgotten flavors of the American past. So, there was a bit of a line out the door when we arrived, but that allowed us to look over the menu offerings. 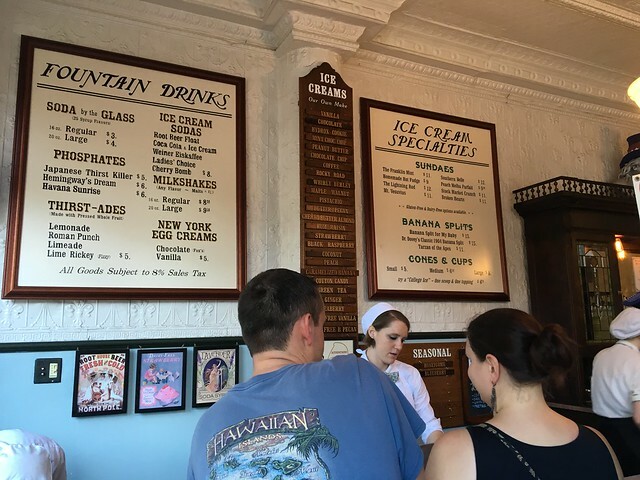 They have sundaes, ice cream by the cup or cone, college ices, banana splits, milkshakes, egg creams, phosphates, thirst-ades, ice cream sodas, and hand-drawn sodas. 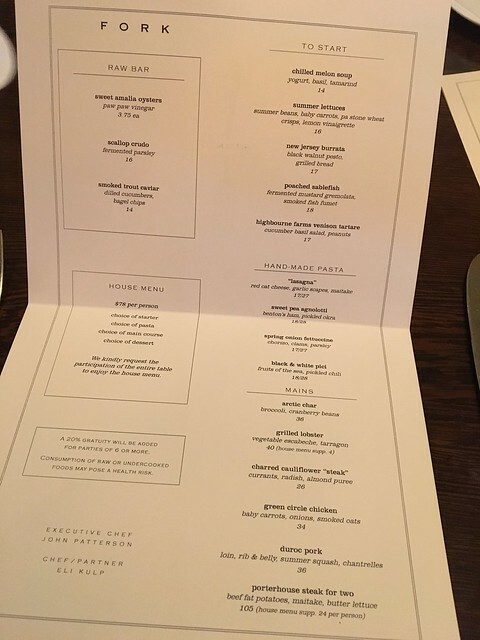 You can check out the full menu for descriptions of each of those. Hydrox Cookie: the original Cookies-and-Cream, invented before the OREO. One of the seasonal flavors was "Honeycomb," which sounded pretty good, so I went with that. After we got our orders, we sat outside to scarf down the cool ice cream on a pretty warm day. I had to keep swatting bees away (maybe honeycomb wasn't the best choice? ), but beyond that, it was tasty. The ice cream isn't a totally smooth texture like I'm used to. Homemade ice cream usually does have a bit of a grittier texture. There was soft ribbons of honey and some more caramelized pieces throughout (though not enough). Overall, a pretty good bit of ice cream and a cool concept. I'd love to try some more of the other flavors. I've never had Northern European-style food. Until now. 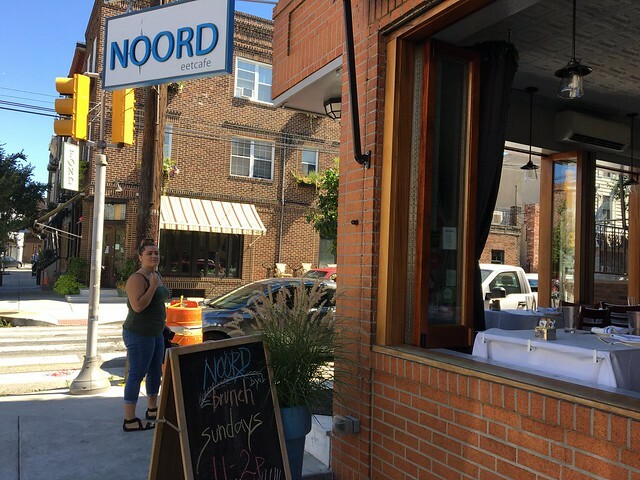 While we were in Philadelphia, we went to Noord for brunch. This restaurant features Dutch and Scandinavian cuisine in a cute little area with large, open windows that allowed the breeze to float in. First off, I knew BYOB was a big thing in Philadelphia restaurants, but I didn't realize how far they took it. Our waitress - I'm not sure how else to put this - was sloshed. She was stumbling around, dropping things, couldn't recite the specials because she forgot and we "didn't need to know them anyway." She slid her finger across my phone case and said she liked it and then giggled. Wut. I was trying to diagnose whether this behavior is acceptable or not, and as far as I could tell, this seemed to be the norm. Bizarre. Fortunately, the food was incredible. 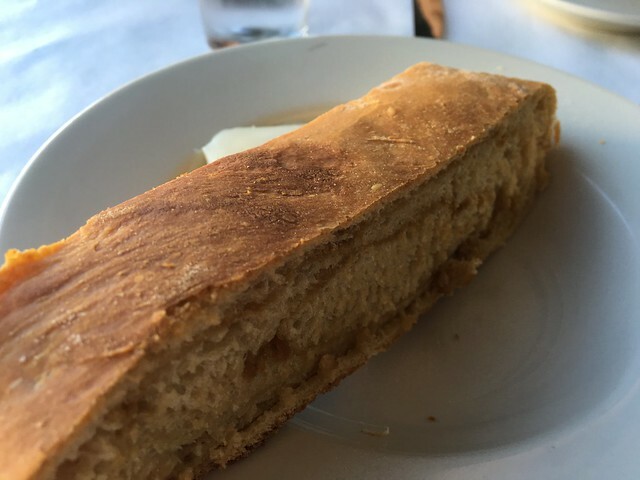 We were first served a sliver of bread that was freshly baked, warm, moist and way flavorful. I was on board. 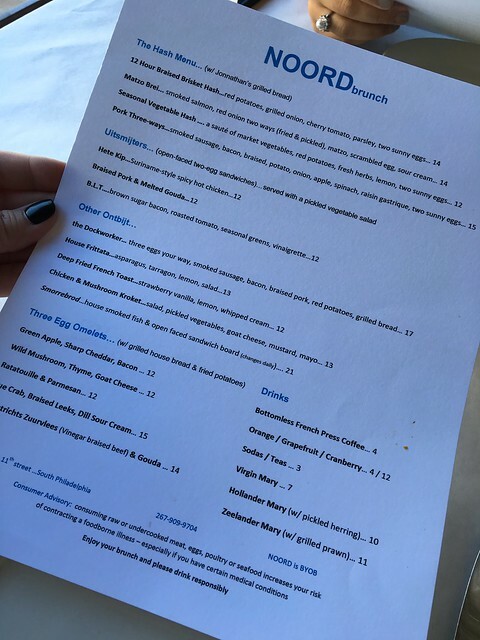 For my entree, I ordered the Smorrebrod (after not knowing the specials) because it featured house smoked fish and open-faced sandwiches. Sounds good, right? my GOD it was good. Not only is this plate absolutely beautiful, it was entirely perfectly balanced. 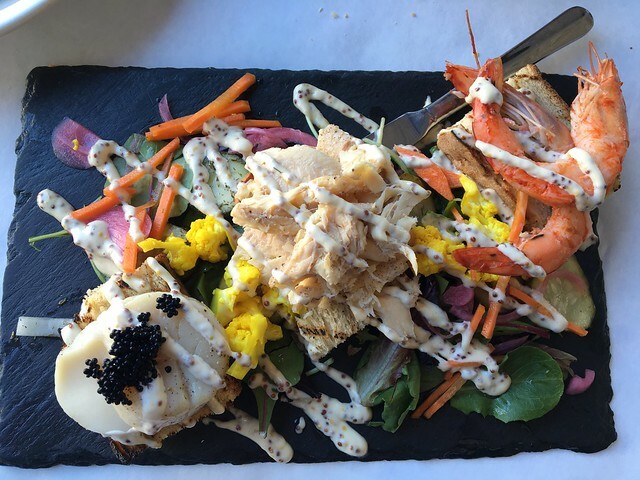 There are three separate pieces of toasted rye bread topped with a scallop and caviar, fish and prawns. 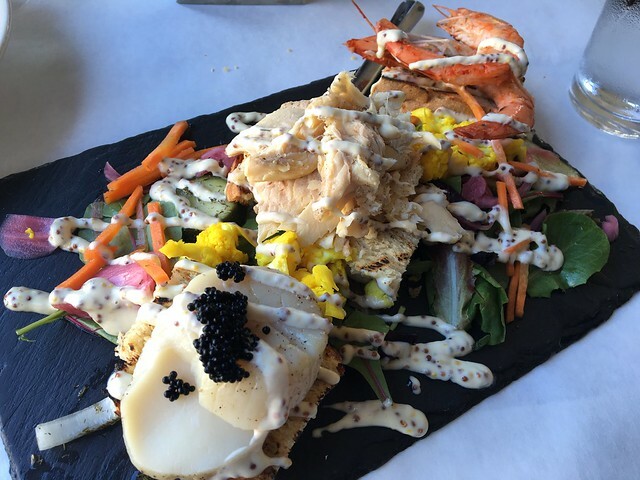 And, all around are pickled red onions, carrots, cauliflower, cucumbers, greens and topped with a tartar/mustard cream sauce. I devoured this plate. Everything had a nice sour and sweet and crunchy and creamy flavor. Every bite was different and fun. 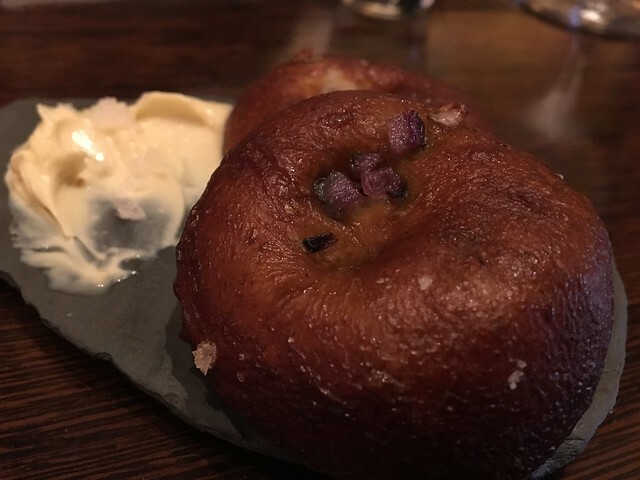 It was delicious, and I might have to travel to Philadelphia again just for this dish. 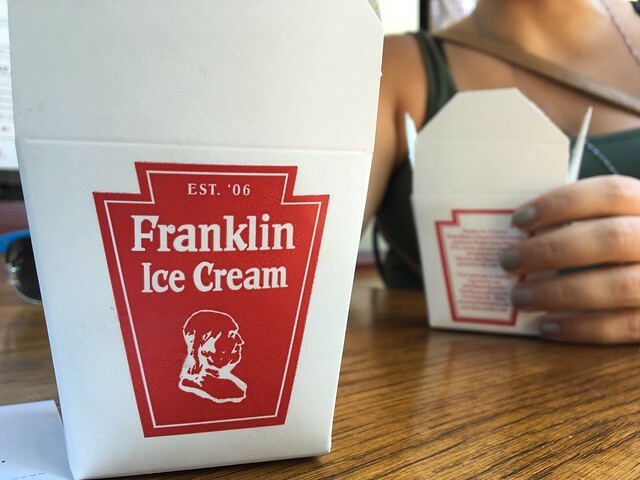 So, is it really a good day if it doesn't include ice cream? I think not. 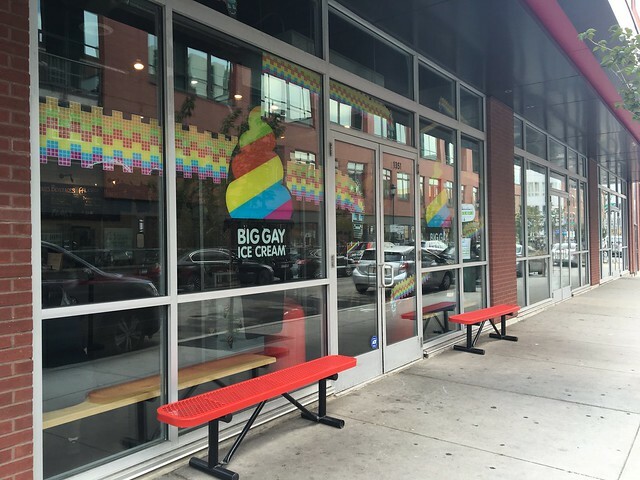 To squelch any potential for a bad day, we went to Big Gay Ice Cream. 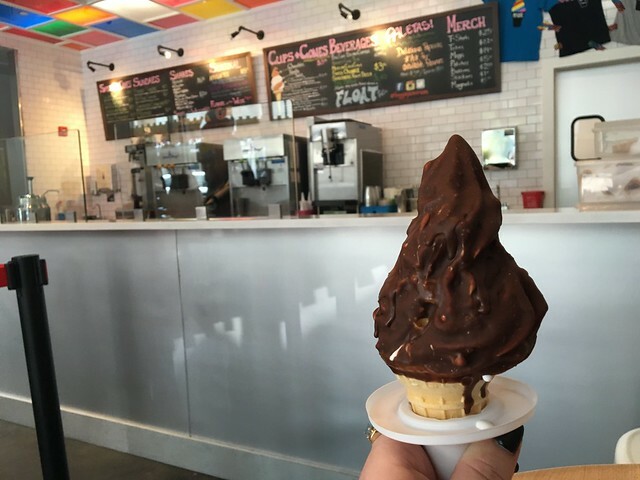 Throughout their years living in New York City, Douglas Quint and Bryan Petroff had always focused on their respective careers — until they got themselves a Big Gay Ice Cream Truck. 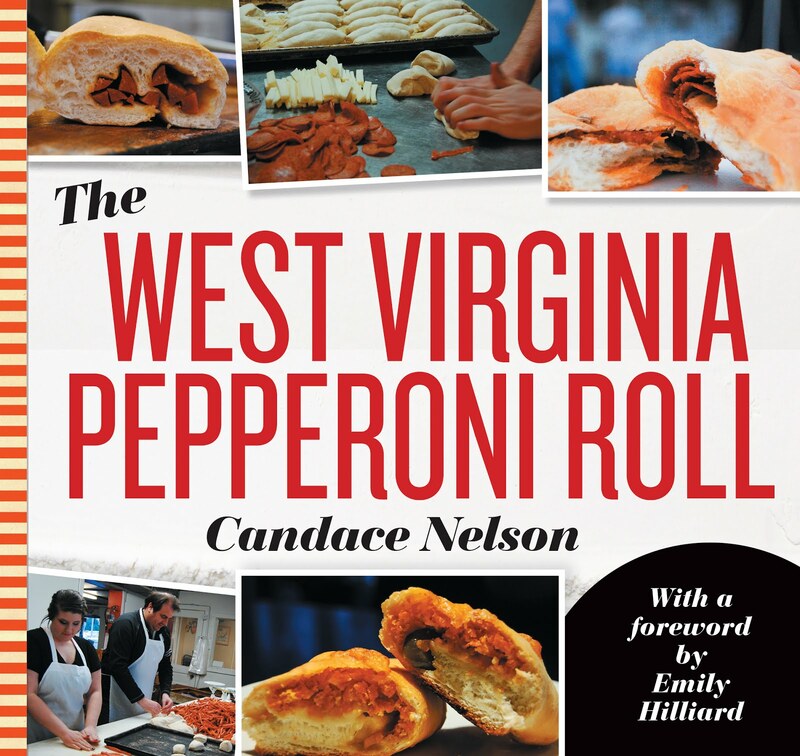 Their seasonal truck debuted in June 2009, and since then, the business has seen a whirlwind of publicity and has become a New York favorite. 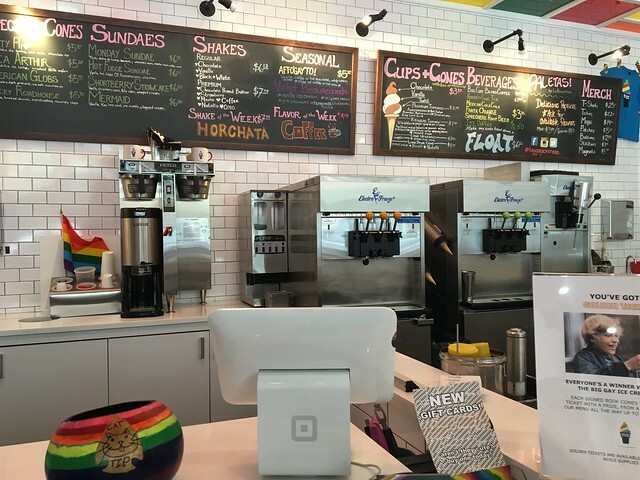 With a playful attitude, Big Gay Ice Cream spins a new take on old-school soft-serve by creating fun and unique ice creams, toppings, and frozen treats that appeal to a diverse mix of clientele. 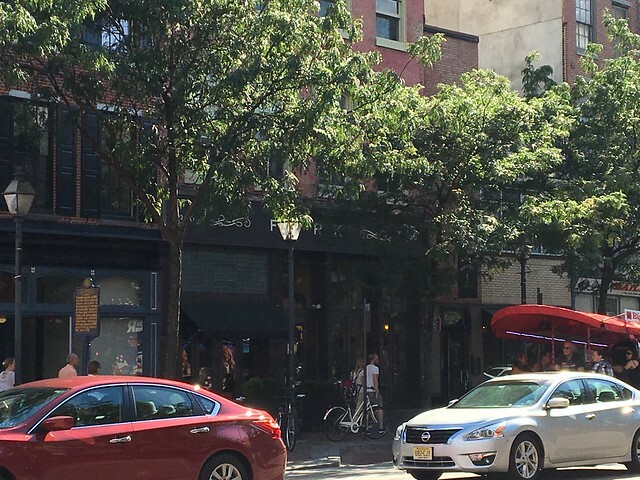 In May 2015, they opened a new store in Philadelphia, their first outside of NYC. 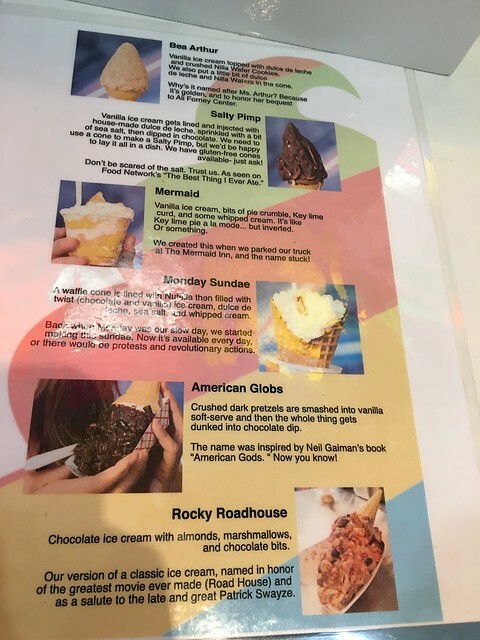 The shop has a colorful storefront, a very clean and slick interior and crazy ice cream names, like "The Salty Pimp." 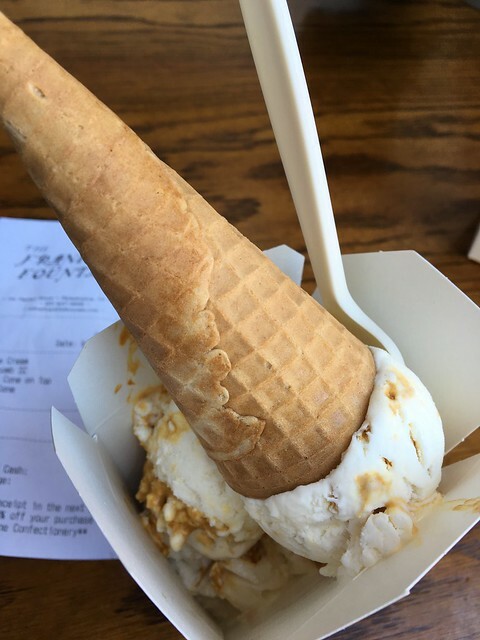 The Salty Pimp is their most popular cone, so I went with it. It was also on "Best Thing I Ever Ate." Vanilla ice cream gets lined and injected with house made dulce-de-leche, sprinkled with a bit of sea salt then dipped in chocolate. It even comes with a little cone holder (much needed). I appreciate the vanilla and loved how the caramel was sprinkled through in spots throughout. The only downside for me was the chocolate coating. It really adds a whole different texture (and don't love it sticking to the roof of my mouth). Not my favorite ice cream addition, but I can see why the little bit of crunch is nice. 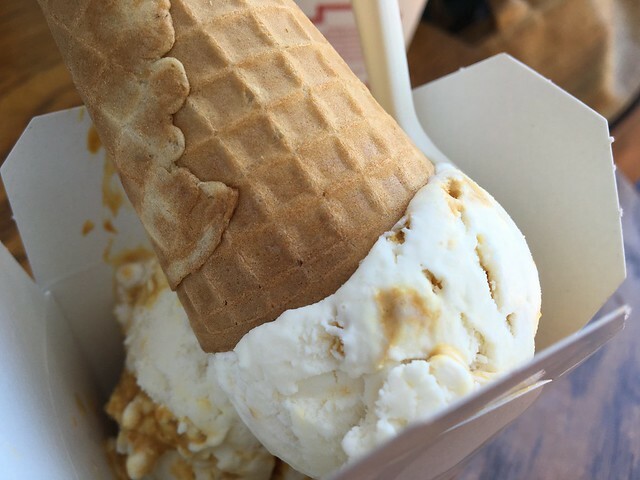 The salt and caramel combination, though, yes. Yes, all day long.